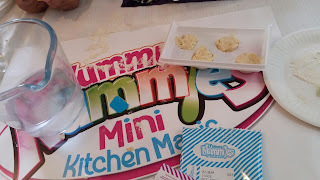 Yummy Nummies are set to be the latest kids craze in 2015 and we are so please to be able to try Yummy Nummies. The girls love baking and to be creative and Yummy Nummies seemed ideal for them. The packaging states from 6 but my 3 and 4 year old managed to create their Yummy Nummies with minimal supervision. Yummy Nummies are a no bake super tiny food craft. They are not intended as a main meal or really as a snack, think of it as a treat. They are however great for sparking imagination and creativity and you can eat your Yummy Nummies creation afterwards. The girls certainly had fun creating Pizza and Cookie. My youngest wasn't too keen on the cheese on the top of the Pizza as it tasted a little like Parmesan which is something she does not like. However the cookies disappeared very quickly! Yummy Nummies were really simple to do Mix, Make and Enjoy, it really is that easy. The Yummy Nummies site contains lots of handy FAQ should you need any help. I think they would make an ideal gift for one of my daughters friends. Yummy Nummies really do have kitchen magic.